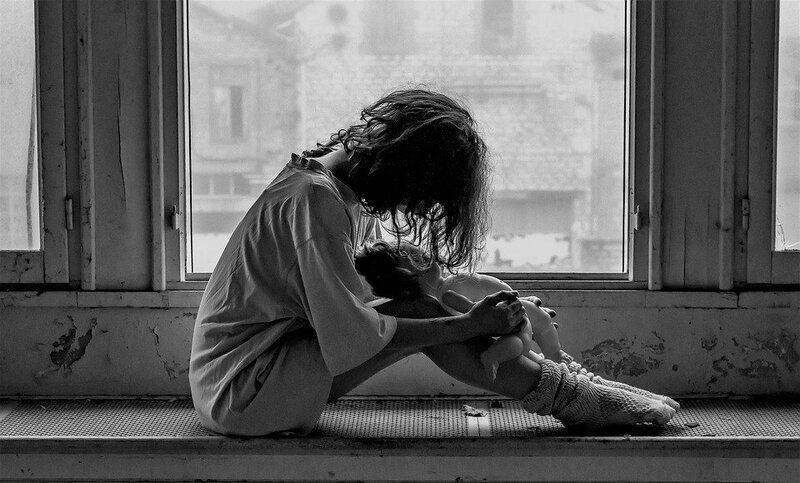 What exactly does melancholy mean? It may be a word you’ve heard many times before, especially if you read a lot – and it describes one of the four major temperament types dating back to the time of Hippocrates (460-370 BC). Knowing the 4 temperament types and their major traits will help you understand them (and yourself) better. This will lead to better relationships and getting the outcomes you want. Try this 5 minute online personality test to find out what type you are! This post explores the Melancholy temperament in more detail. you will find links to the other 3 types at the end of the post. Melancholy people are one of the two INTROVERT personalities in the 4 temperament theory of personality. If you are an extrovert, you will not be predominantly a Melancholy, but you may be blended with the extrovert Choleric personality, or less likely, the extrovert Sanguine personality. Quiet and serious: This is the most quiet of all the personalities and is characterized by a deep and serious persona. You are not a person to be trifled with as you take life seriously. There is a great deal of deep consideration under that quiet exterior – you do not operate on a whim. Purposeful perfectionist: You have very high standards, for yourself and others. You don’t waste your time without purpose, or indulge in small talk. You were made for deep conversation and you are conscientious to a fault. Sensitive and self-sacrificing: Very loyal in nature, you are an amazing friend who would do anything for your family and friends. You usually put your own needs last and have vast compassion. 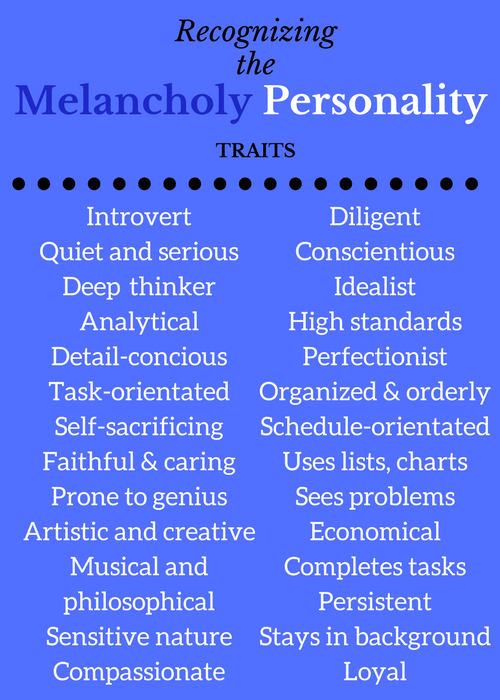 Melancholy traits – gifted, artistic and dramatic. Prone to genius: You have skills in the creative line – maybe artistic or musical, you have a philosophical nature with a great appreciation for beauty. Task and schedule orientated: Dotting all the i’s and crossing all the t’s is a no-brainer for you – it comes naturally. You pay attention to detail with a thoroughness to be envied by others, and persistently finish what you start. You don’t seek the limelight, and are happy to stay in the background, quietly efficient. You have a preference for using lists and charts, and are always well organized. Analytical problem-solver: Your strengths include listening to and solving the problems of others with deep concern. You easily see potential problems that others overlook, and are good at working out economical solutions. The fact that you are deeply caring and compassionate. You are the loyal friend who can be trusted, and you are reliable – you do what you say you will do and you are no fair-weather friend! You always get the job done to a high standard. It is great to be on a project team with you as you ensure that the budget is kept and the fine details are covered. Although you are an amazingly talented person, often artistic, musical or poetic, and extremely efficient, you never hog the spotlight and are content to be in the background supporting those important to you. You are the original unsung hero! Your life motto is: IF IT IS WORTH DOING, IT IS WORTH DOING PROPERLY! As a baby, you were quiet and undemanding, preferring routine and an established schedule. You did not much like change, or being dragged around and passed from person-to-person. Even as a child you were introspective and serious, and did not smile easily. You were hardworking and conscientious at school, loved by teachers for your high standard of work, effort and good behavior in the classroom. Sadly, you may often have felt overlooked because you were unlikely to put your hand up in class to answer questions even though you knew the answer where others didn’t. You had one or two close friends, rather than a larger group of more casual friends. People would seek you out and tell you their problems as you were one of the few people who would actually listen to them and give thoughtful advice. You preferred to work alone, rather than in a group, as the poor quality of work and lack of interest of others annoyed you. You wanted to get good grades, and others working in a group with you benefited from your efforts. You may not have wanted attention, but your many talents may have thrust you into the spotlight anyway. 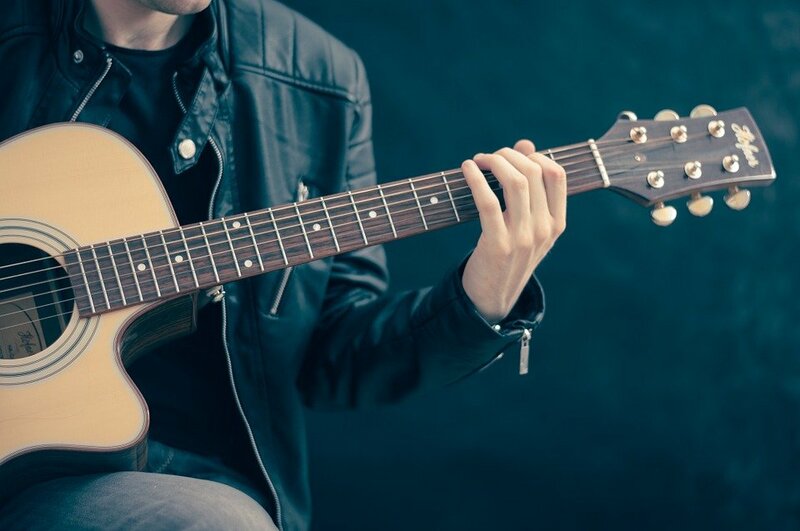 You have musical, artistic or writing talent, and possibly played one or more instruments and sing. Perhaps a writer of songs or poetry, those close to you encourage you to display your talents which you use to express yourself personally. You likely graduated from high school with a clear idea of what you wanted to do with your life, and most likely, very good grades. You “had your head screwed on right”, even at school, and were seen as the sensible one by everyone else. You will have spent time researching careers, researching colleges, doing personality tests and doing whatever you could to make the right career choice. Others don’t like your perfectionism. It puts them in the uncomfortable position of having to do better themselves, or to always feeling like they can’t possibly please you. You may be seen as hyper-critical and overly sensitive. If you find that you are pushing people away, it may be because you have taken offense to something they do not even know offended you! This is because they would not have been offended by that “thing” that offended you, and they may not even have meant to offend you. Remember, too much of a good thing may not be a good thing – I knew a woman who had no friends – she insisted all visitors take off their shoes when coming into the house and walking on the white carpets, and she was not keen on people sitting on her white furniture. Melancholics seek perfection in a romantic partner, which of course is impossible, so you might end up lonely, or having many short relationships. You have to give people (and yourself) a break! Have high standards by all means, but not impossible to the point of misery and loneliness. Figure out what is a deal breaker and what is not. Doom, gloom and walking on the shady side of the street with a constant cloud over your head tends to scare people off. Constantly keeping score of the faults of others won’t win you any points. You may not think you are doing this, but…if you’re having trouble with some relationships, look into this. As a Melancholy, you are a quiet, unobtrusive personality, the one most likely to wish that you were another type, especially more outgoing. You may have low self-esteem and look for compliments and approval from others, which when given, you may not believe. Your introspective nature causes you to be very hard on yourself, and you fail to see the wonderful depth of character you offer the world, choosing to see instead the glitz and noise of other types. You are talented (many of the world’s geniuses are Melancholy personalities – depth needed here! ), and your compassion is so needed in a fickle and shallow world. Never underestimate yourself…you are the quiet backbone of so many wonderful things! Do you recognize someone as having many of these traits? 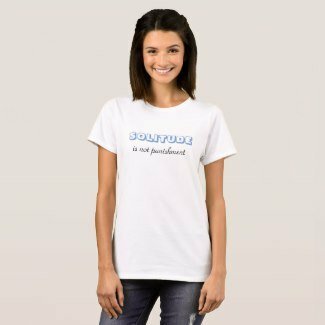 Perhaps even yourself? 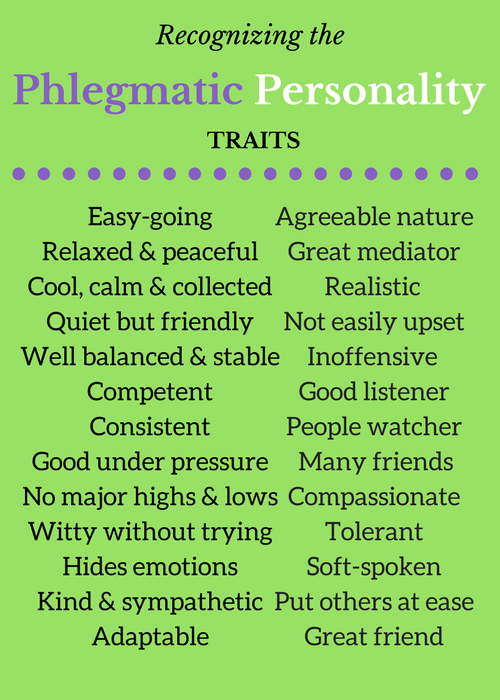 Do you agree or disagree that these are great temperaments to have? Tags: Gifted Melancholy personality, introvert, Melancholy personality, personality, What is Melancholy? 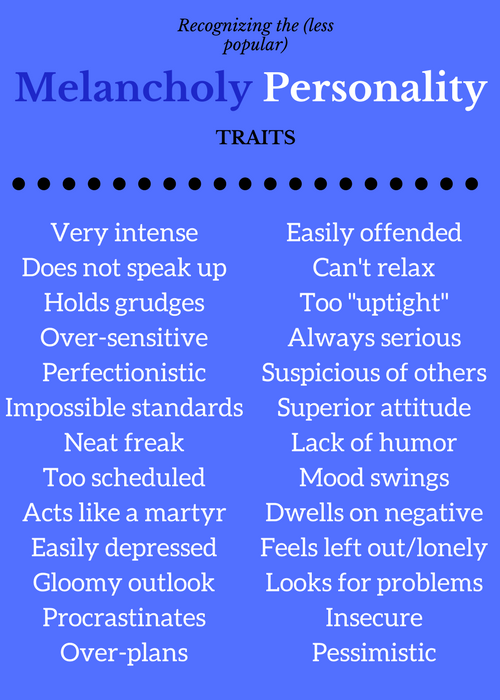 I definitely like the personality descriptions, I find myself to be melancholy 100%. Excellent and deeply thorough personality analysis. What I find negative about this website is that all the pages, Fit Body, Fit Soul and Fit Spirit all look alike and basically are mirrors to each other, if you don’t mind me say so. The diet and supplements page are great, easy to read, short and to the point. 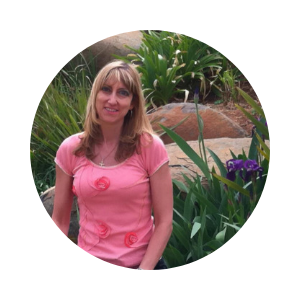 What about lipoic acid? Shouldn’t it be recommended for women as well? Lol, MilanK1, your response made me smile…it is such a Melancholic response and you said that you tested as 100% Melancholy! The pages you mention are meant to be similar, however the content is vastly different! Body, soul and spirit are the three, separate and very different aspects of the human condition. As for your mention of Lipoic acid, just one of a few I’ve not written about yet. Thank you for this post. Somehow I’ve completely Missed these personality types in all my years. 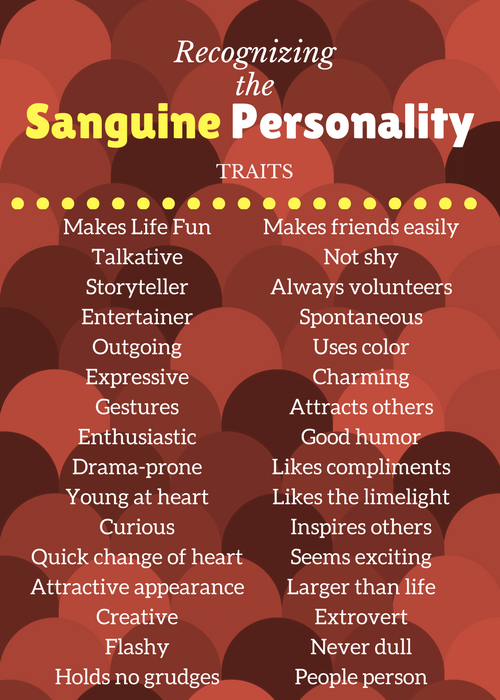 The Melancholy personality is me to a tee, although I had hoped I was Sanguine haha. You give a quick, simple rundown of the types, which I really like. Can’t wait to see more information about the types in the future. 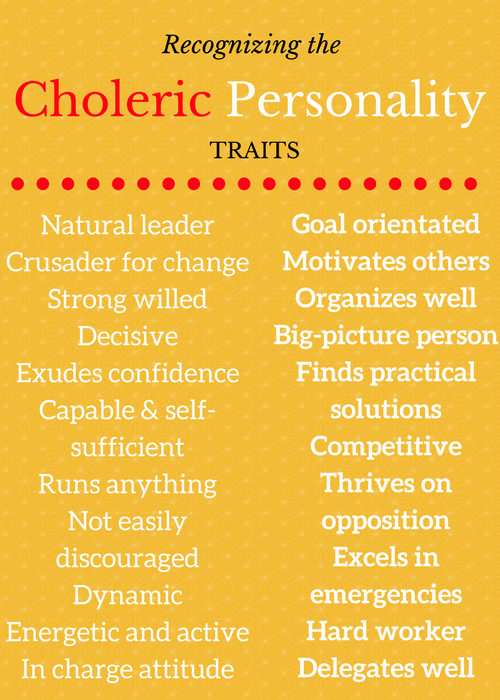 The reason that I love this type of personality profiling is that it is so quick and simple to identify the types! Myers-Briggs is very detailed but also much more complicated to understand and remember. I will certainly add some more information to this popular topic in future!